In December of 2018, NPR asked the internet a question in its article, "Vitamin Treatment for Sepsis Is Put To The Test", asking, "Could the leading cause of death in hospitals really be treated with intravenous vitamin C, the vitamin thiamine and doses of steroids?" Read on as doctors from a variety of disciplines examine and critique the conversation growing around intravenous Vitamin C! "Hundreds of thousands of people die in the U.S. every year and millions of people in the world die of this," says Sevransky, a critical-care physician at Emory University. "So when somebody comes out with a potential treatment that is cheap and relatively easily available, it's something you want to think about." Sevransky ended up doing much more than think about it. The Marcus Foundation in Atlanta, a major donor to Emory, approached critical care doctors there after hearing about the potentially revolutionary treatment and offered to fund a careful scientific study to see whether it actually worked. "One of the things they were very interested in doing was getting an answer quickly," Sevransky says. So he teamed up with researchers at Johns Hopkins University in Baltimore and Vanderbilt University in Nashville, Tenn., to design a study that could take place at up to about 40 hospitals simultaneously, in order to get a large number of patients into the trial in short order. Dorian Pelfrey was one of the first to enroll in the study. He and his wife, Shauna, had traveled to Emory from their home in Greenville, S.C., because the 44-year-old man's liver was failing. He was in urgent need of a transplant. Dorian had exceptionally good news — within days of getting on the transplant list, a liver became available for him. But he also had a serious setback. Shortly after arriving at Emory he developed sepsis – the body's out-of-control reaction to an infection. Dr. Jonathan Sevransky, a critical care specialist at Emory, and colleagues at Emory, Johns Hopkins and Vanderbilt, organized a clinical trial to quickly assess a promising treatment for sepsis. Lynsey Weatherspoon for NPR Dorian's blood pressure dropped, and his heartbeat became irregular. "He went from doing OK to just doing really bad, in very little time," Shauna says. And she was doubly concerned, "especially with trying to keep him well enough to get to a liver transplant." Everyone in the trial would get the usual intensive medical care from nurses and medical staff to treat sepsis. That includes high-dose antibiotics, careful control of blood pressure to prevent or reverse shock and, often, mechanical help in breathing. Shauna decided to enroll him, and within hours, doctors and nurses swung into action and started giving him the experimental drip. "It was a long four days of lots of medicine, lots of care, from a lot of different doctors, a lot of different areas of medicine," Shauna recalled a few weeks later. "And then he did become well enough to receive a liver transplant." The Pelfreys have no idea whether he got the experimental treatment or the placebo. But Shauna says she's OK with that uncertainty. "I'm all for research to see if it could help another family — somebody else's loved one," she says. In any event, Dorian's health has slowly been improving since his bout with sepsis and his liver transplant. Critics Trying To Stop A Big Study Of Sepsis Say The Research Puts Patients At Risk SHOTS - HEALTH NEWS Critics Trying To Stop A Big Study Of Sepsis Say The Research Puts Patients At Risk Clinical trials like this are the primary way that medical scientists sort out what just seems to work from what actually does. There are currently more than 100,000 listed in a federal database as ongoing in the United States, though many will never be completed for a multitude of reasons. Studies in critical care medicine are particularly challenging. Doctors have to move fast to respond to rapidly changing health conditions, and patients are often not in a position to give informed consent. They may be delirious or even in a coma. Gradually, though, study designers have figured out how to get these studies done. And that's changing the practice of critical care medicine for the better. "Back in the dark ages when I was in training, almost 100 percent of what we did was based on experience" rather than scientific evidence, Sevransky says. And he remembers that the specialists at one hospital would sharply disagree with those at another. "Now probably 25 percent of what we do is based on data and 75 percent is based on experience," he says. "And it would be awfully nice to raise that 25 percent much higher." That's part of his motivation for doing the study, which, after all, will contribute to scientific knowledge whether the treatment is a great success, a dud or something in between. Sevransky finds that gratifying. "And it's enjoyable to work with a team of people," he adds. "Research, it's like a team sport." It's also a huge time commitment — Sevransky figures he and his collaborators put in something like 10,000 hours to bring the study to life. Each hospital has a team to coordinate the experimental treatment. All this work takes time and money, typically several million dollars for a study of this nature, though Emory isn't disclosing the budget for it. At Emory, Dr. Kate Nugent and clinical research nurse Christine Spainhour did the all-important legwork of telling doctors in the various intensive care units and emergency rooms that the trial existed – and how to identify patients who could be eligible. Nugent, who oversees the trial at Emory, ginned up enthusiasm for the study, and now, she and Spainhour take calls on the trial's dedicated hotline any time of the day or night when a doctor has identified a potential participant. Time is of the essence. Her goal is to review the patient's chart within 30 minutes and to start treatment within about four hours. Getting the word out to the various ICUs was the big push. "After patients started enrolling, it was like a ball rolling down a hill and people are very excited about it," Nugent says. 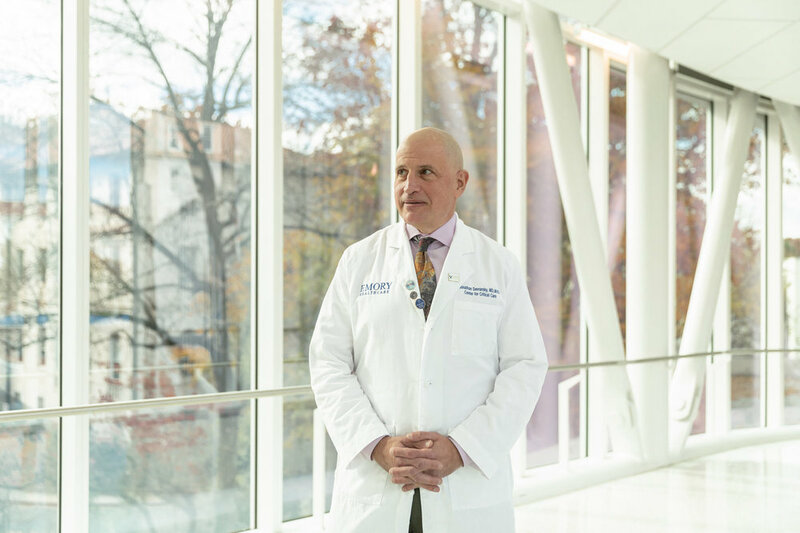 "Getting a clinical trial done within one year, which is our goal, is actually lightning fast," says Dr. Craig Coopersmith, who currently oversees critical care at Emory. Indeed, speed is baked into the study design. Once 200 patients have been enrolled, an independent group of researchers will take a peek at the data to see whether there's a big difference between the patients who got the vitamins and those who got the placebo. "If there's a huge effect, the trial gets stopped prior to the 500 patients," Coopersmith says. Doctor Turns Up Possible Treatment For Deadly Sepsis SHOTS - HEALTH NEWS Doctor Turns Up Possible Treatment For Deadly Sepsis A huge effect would be like what Dr. Paul Marik has reported from his hospital in Norfolk, Va. He asserts that few people in his critical care unit die from sepsis. (He was inspired by related research on vitamin C by Dr. Alpha Fowler at Virginia Commonwealth University). Coopersmith expects that, if there is an effect outside Marik's hospital, it will be smaller. So the study involving 500 patients is designed to detect whether the vitamin infusions improve outcomes by at least 10 percent. That may not sound like a lot, but "10 percent would be massively important," Coopersmith says. "Mortality from sepsis is higher than any other condition in the hospital," so a 10 percent decrease would save tens of thousands of lives in the U.S. every year. This is such an important question, there are actually about a dozen studies of vitamin treatment for sepsis underway around the world. Researchers at Beth Israel Deaconess Medical Center, a Harvard-affiliated hospital, is in the midst of a study that plans to enroll 200 patients. As of Dec. 11, they had enrolled 87 people in 12 hospitals. (This study is also funded by a private foundation, The Open Philanthropy Project). Together, these studies will either tell doctors that there's a remarkable new treatment for a deadly disease or that it was another good idea that just didn't pan out. At Onus iV, we're always looking around the health & wellness spectrum to see what conversations are happening and for the trends that fuel their growth. In Colorado, CBD has gained a tremendous following due to health benefits associated with the non-psychoactive Hemp plant. Read the article below for some interesting insite around the health benefits of CBD as a potential headache remedy! Happy Yelpers make us happy too! 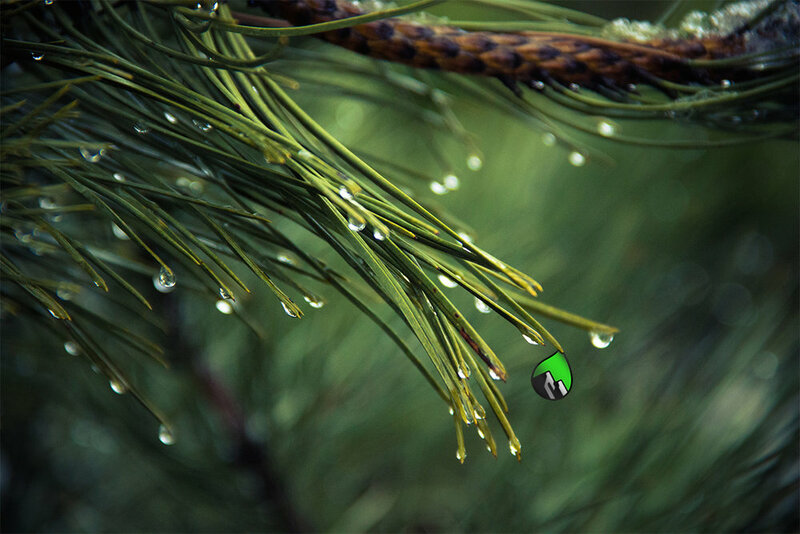 We love the opportunity to help make each of your days just a little bit better, no matter what brings you in! Here's what a few of our clients around Boulder, Colorado have had to say on Yelp! "Onus is truly the best. The staff is incredible, I have sat with John, Max, and Kelly and I truly cannot say enough about the level of care I have received. Every time I am here is a pleasant as the last. I do the Vega treatment and I leave Onus feeling better always. The environment is beautiful and relaxing and very boulderesque. It has been such an awesome experience to find a local IV spot that I love so much. I will always continue to come back and recommend to anyone in need!" "Very comfortable setting in a good central location. Max was very knowledgeable, professional and kind. So glad this is available in Boulder, it's a natural. I'll be back! "This was truly an incredible experience! The Phoenix iV was awesome. I'm so happy I got to finally try it out, and I'm so pleased with how I felt during and afterwards!! Everyone was super helpful and friendly! I would 100% go back- thanks guys!" First time going an IV clinic - Kelly was great, comfortable environment, wish they were available back home in Boston! Onus IV Hydration is a lifesaver! If I'm ever worn down from work outs or starting to feel a cold coming on, I head to Onus for one of their IVs that can be personalized to your needs. I always leave feeling rejuvenated and relaxed for days following. The Boulder location is very relaxing and the providers are always knowledgeable and friendly! For more of our stellar reviews, check em out here! We're honored to be a part of your story, Fluid iV Lounge :) Thank you for the mention! Fluid IV Lounge, a new intravenous hydration therapy provider, is opening this week at Longmont's Terry Street Collective. The collective, launched this year by Noel Love and her fiance Scott Kaier, is home to a mix of massage therapy, psychotherapy, skin care and acupuncture practitioners. 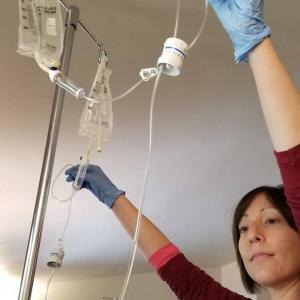 "The trend of IV therapy seems to be really catching in a lot of places," Kaier said. Fluid IV Lounge "complements what we are already doing at the collective and we think it will be a good fit for Longmont — there seems to be a good amount of interest and curiosity about it." The grand opening for Fluid IV Lounge is set for Saturday and walk-ins are welcome. "We want to provide a more connected kind of wellness experience," Love told the Times-Call when the collective opened in May. " ... We want all the practitioners to embrace providing care that's personalized and customized." While there are several spas in the city that offer forms of hydration therapy, Fluid IV Lounge will be Longmont's first business solely dedicated to the practice. Onus iV, a Denver-based chain of IV therapy facilities, opened last year in Boulder. The Fluid IV Lounge space will have four chairs where nurses will administer hydration therapies. The process involves dripping a saline solution with a mixture of vitamins, minerals and nutrients directly into a client's vein. The therapy can help alleviate hangover symptoms, boost the immune system during cold season, and help athletes recover from intense workouts, Kaier said. "We are going to be treating people who are generally healthy but just want a boost," he said. One of the main offerings will be a mixture of B vitamins, vitamin C, calcium and magnesium known as the Myers' Cocktail. The mixture was developed by Baltimore physician John Myers in the 1950s. Prices for different treatments will vary, but clients should expect to pay about $150 per session. Initially clients can only purchase sessions individually. But Kaier said within a few months, hydration therapy will be part of the collective's membership program. That program will allow patients to purchase a monthly membership that gives them access to a host of the services provided by the collective's practitioners. The Amazing Benefits of Running! At Onus iV, we're always on the lookout for the best intel to help you hone in on your perfect self. Many of our nurses are runners, two of which who have qualified and ran in the Boston marathon! This article out of Sports Fitness Advisor really helps drive the point home - check out their article, 35 Amazing Health Benefits of Running, According to Science (+10 Tips for Beginners) below! Keep running towards your best days :) We'll see you there! 35 Amazing Health Benefits of Running! Magnesium (Magnesium Chloride) is a magical compound. Not only is it a building block for essential body functions but this compound is efficient and highly potent. This mineral is technically a salt and in its basic form, can be found in “hard” drinking water.